Declining ownership cost of electric chimney, increasing consumer awareness, rising adoption for modular kitchen, growing purchasing power as well as increasing need to evade cooking smoke and gases have buoyed the market of electric chimneys in India. Upper middle-class group contributes majorly to the growth of electric chimney market of India, primarily across wall mounted and built-in kitchen hood segments, whereas, majority of the island chimney demand has been derived from high-income group. According to 6Wresearch, India electric chimney market size is projected to grow at a CAGR of over 14% during 2017-23. Over the past few years, electric chimney market has experienced rising consumer awareness towards adoption of these solutions. This trend is likely to continue during the forecast period as well owing to rising disposable income and surging standard of living. In terms of market segments, wall mounted electric chimney solutions are anticipated to drive the market growth due to their higher integration across various existing and upcoming residential and commercial applications. In 2016, the Southern region accounted for largest market revenue share in the overall India electric chimney market share followed by the Northern region and others. Major construction projects across commercial and residential application verticals, coupled with increasing consumer awareness are the key factors leading to the growth of electric chimney market. Some of the key players in India electric chimney market include- Faber Heatkraft, Pigeon, Glen, Elica, IFB, Prestige, Kaff. Kutchina, Hindware, and Sunflame. India electric chimney market report thoroughly covers India electric chimney market by types, applications and regions. 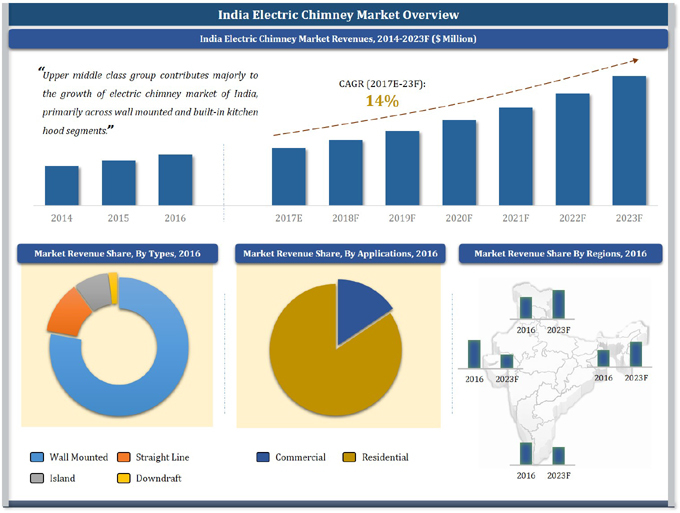 India electric chimney market outlook report provides an unbiased and detailed analysis of the on-going India electric chimney market trends, opportunities high growth areas, market drivers which would help the stakeholders to device and align their market strategies according to the current and future market dynamics. 10.2	Sunflame Enterprises Private Ltd.
10.3	Franke Faber India Ltd.
10.4	Glen Appliances Pvt. Ltd.
10.6	Hindustan Sanitaryware & Industries Ltd.
10.7	Bajoria Appliances Pvt. Ltd.
10.9	Whirlpool of India Ltd.
10.10	Elica PB India Private Ltd.